Click here for Part 6 – God’s Purpose On This Journey. At the first port stop in Grand Turk, everyone who attended the conference stayed together. 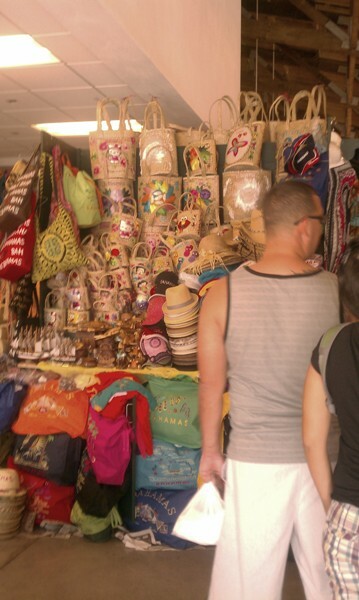 I wanted to linger at the downtown market to shop, but everyone was ready to quickly head back to the beach. At our last port stop in Nassau, I went alone so I could get some souvenir shopping done for my family and friends. I loved swimming at Grand Turk and Half Moon Cay beaches, but I enjoyed shopping the most at Nassau. Nassau is like a busy American city, with a variety of stores, restaurants, and activities. 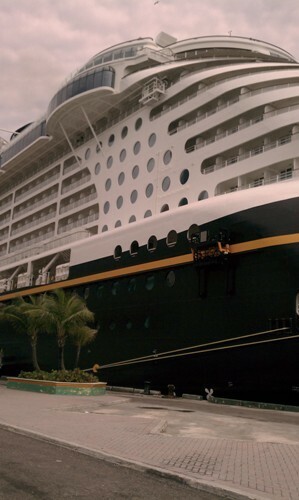 As we were pulling into the port at Nassau, we saw the Disney “Glory” ship. It’s even bigger than the Carnival Destiny. When Tony was speaking Friday morning, she was sharing about fulfilling our destiny for God’s GLORY – then she looked out the window and saw the Disney Glory ship, which was confirmation of what she was sharing! One of the things that I prayed about this trip was that Jesus Christ would be glorified. I believe Tony, her team and I accomplished the mission God had for us in the Bahamas. To Him belongs all the praise! 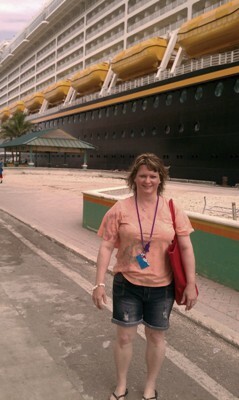 Here I am in front of the Glory ship. How can you stand out with your business? The Bahamans like bright colors, even on their signs and billboards. 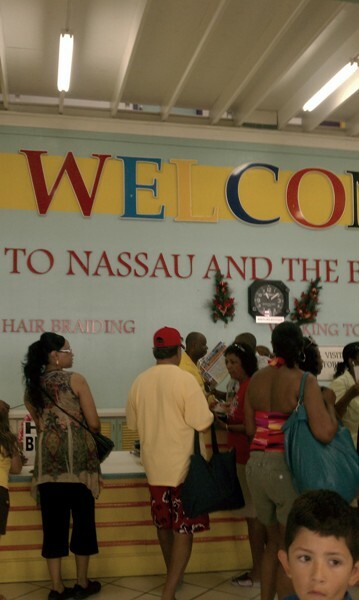 Here is the colorful “Welcome” sign when you get to Nassau. It immediately grabs your attention. Let’s apply this to your business online. What can you do to stand out among the crowd and get people’s attention? As soon as you step off the ship, there are men greeting you with their offers to tour you around the city. One option is a horse and carriage ride. Shopping and good food: Let the fun begin! When I refused, one of them said, “You are going to miss all the fun!” No, I didn’t. I had a BLAST! I walked around the city, shopping at different stores. 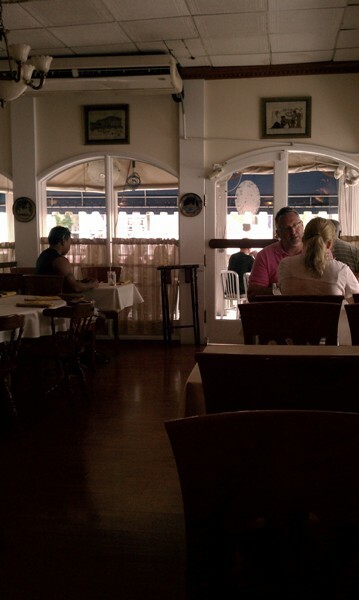 I ate lunch at the Athena Cafe’, a Mediterranean restaurant. Mediterranean food is one of my favorites! 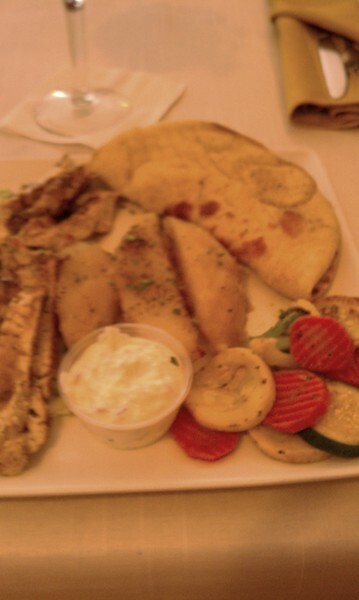 For lunch, I ordered chicken kabobs, grilled veggies, pita bread, and tzatziki sauce. It was delicious! I don’t believe that drinking alcohol is a sin (although drunkedness or addiction is), but I don’t drink a lot. But I did try two drinks on this trip. One was a pina colada in Grand Turk, and the other was a mojito in Nassau. I’d seen pictures of mojitos in the clear glass with mint leaves, and it looked good. The Athena Cafe didn’t have them “on the rocks,” but did have frozen mojitos. It was tasty, but strong! (I didn’t even drink half of it!) 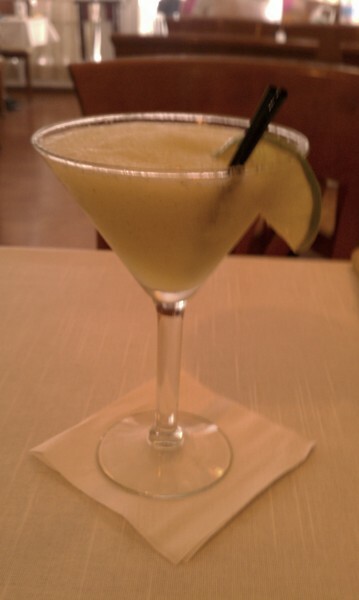 It has a lime flavor and is sweet. After lunch, I hit the stores shopping! 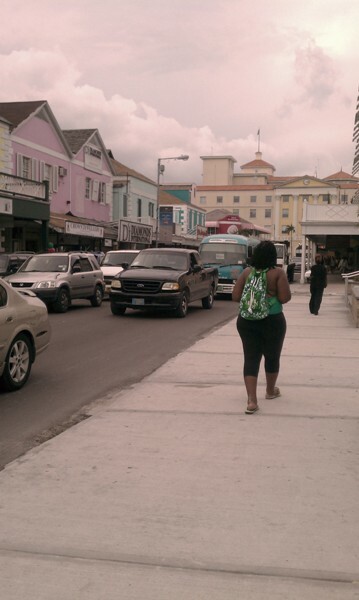 Nassau is a busy city with lots of tourists from all around the world. The traffic is heavy, and there didn’t appear to be any traffic rules! 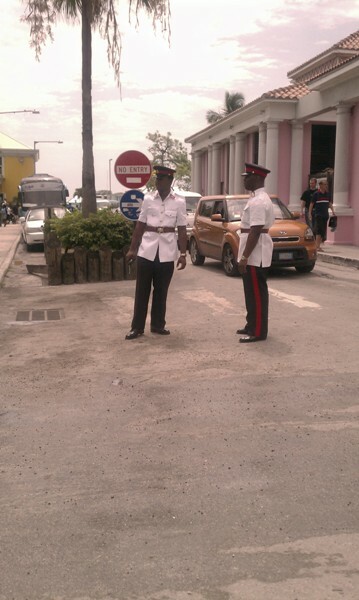 The police are right there on the street corners as soon as you disembark and come into Nassau. I like their uniforms. One gave me directions to the straw market, which was within walking distance. I felt safe enough walking on the streets alone without taking a taxi, but later I read that there is crime in Nassau, with robbers demanding your passport, cash and credit cards. Just stay alert! Musicians play on the sidewalks in Nassau. 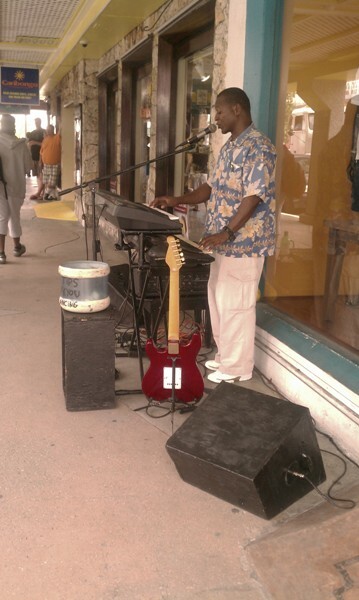 Here was one musician playing Reggae music on a keyboard in downtown Nassau. I enjoyed watching him and listening to him. 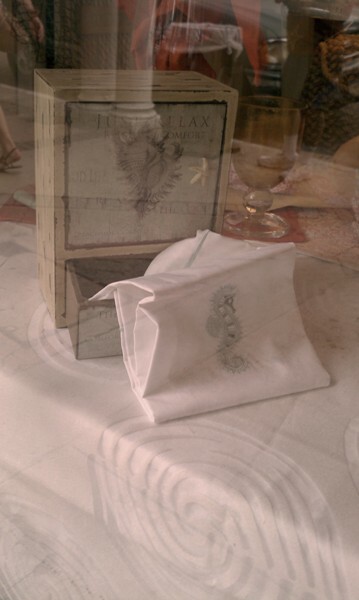 The musicians have tips jars, so that you can tip them for the entertainment. For some, this is their means of survival. I also saw a saxophone player near the port. He was black and had on sunglasses, reminding me of Stevie Wonder. 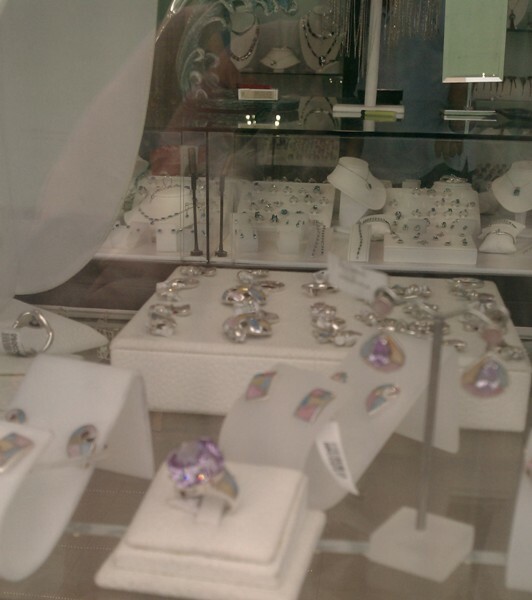 There are diamond stores everywhere in the Bahamas. You can buy diamonds at a fraction of the price that you’d pay in nearby Florida (Nassau is just 150 miles from Fort Lauderdale). Shops include Diamonds International, Jeweller’s Warehouse and Effy Jewellers, all located within walking distance from the main wharf. Other items available duty free include Tanzanite, Silver and Emeralds at Tanzanite International, Prestige Silver and Colombian Emeralds International. 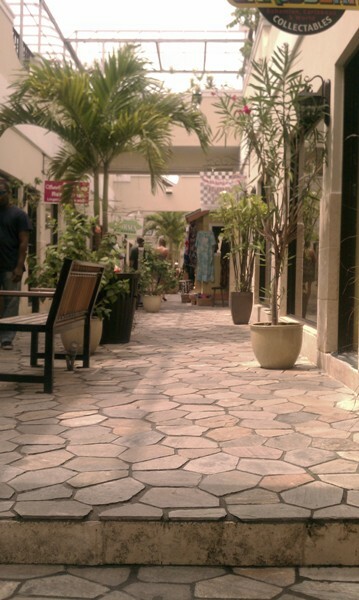 One of the most beautiful shopping areas had a stone sidewalk and a Spanish-style arch at the entrance, with lots of palm trees and other shrubs. I loved it here and could’ve stayed all day. 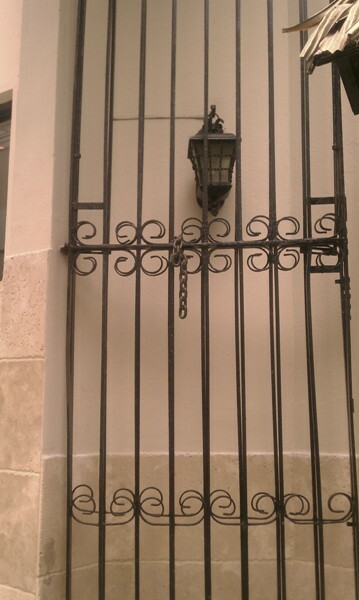 There was a unique, tall, ornate gate at the entrance. 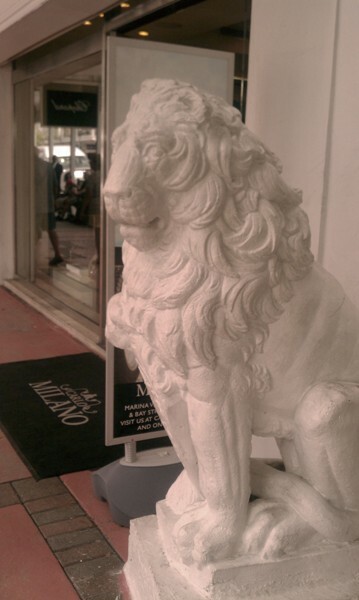 I liked this lion statue by one of the shops. Jesus is the Lion of Judah! 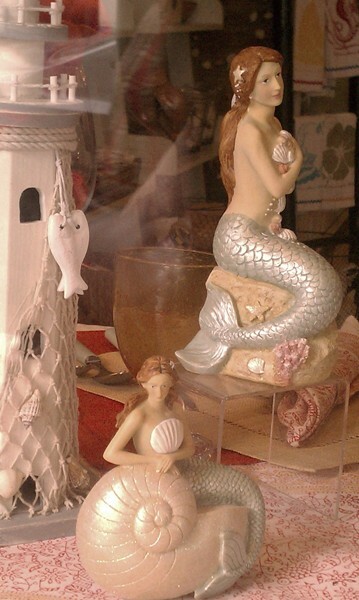 I also loved these mermaids in a storefront window in Nassau. One of my favorite stories about mermaids that Ray used to read to me at night to help me fall asleep when I had trouble sleeping is The Water-Babies by Charles Kingsley. People have been fascinated by mermaids for years, claiming they really exist. There’s even a $1 million award by the Kiryat Yam government in Israel to the first person who photographs a mermaid, who allegedly appears only at sunset, performs a few tricks for onlookers, then disappears into the ocean. This faded blue-green, old-fashioned trinket box and handkerchief embroidered with a seahorse were unique – and lovely, don’t you think? 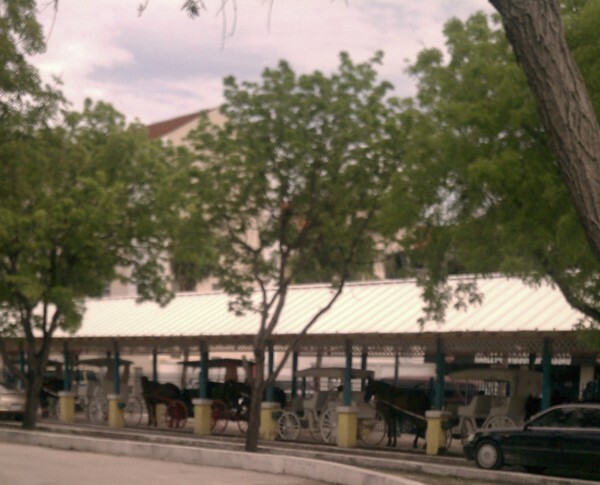 A famous tourist attraction in downtown Nassau is the straw market at the end of the pier. Not for the claustrophobic, it is wall to wall vendors who boldly offer you everything from beautiful, colorful dresses and shirts, wooden carvings to weave baskets, to key chains. Tony found some straw purses there, and had her girls’ names stitched on them – what a creative souvenir! If you have little girls, I also saw a LOT of Dora purses there. 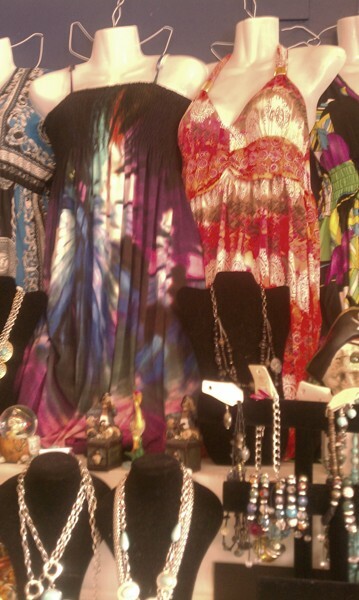 Below is a sample of some of the pretty colorful dresses. 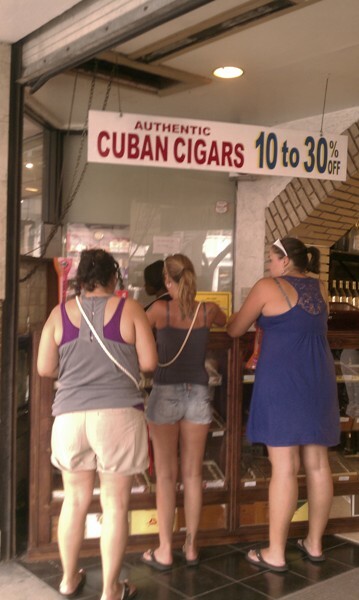 For men, you will find Cuban cigars on sale everywhere! My Business Brain Wouldn’t Turn Off in the Bahamas! I tried to turn off my “Business Brain” on my trip to the Bahamas, but it didn’t happen! The entrepreneur in me came alive! I watched how women with businesses in Grand Turk, Half Moon Cay, and Nassau operated to sell their goods or services. They were not shy or intimidated, but were very bold about their business. They loudly called out to you to invite you into their shops, and to proudly show you their offerings. They knew that they had to show you something unique so that you would buy products from them instead of the other women business owners. My brand new ebook, birthed from this cruise! As SOON as she said the words, “Bahama Mama,” I thought, “That is a book idea!” I am writing the ebook now, and it’s called Bahama Mama: When God Uses Ordinary Women for His Extraordinary Purposes. You’ll hear more about the ebook this week. I am putting the finishing touches on it now and then sharing it with my mastermind group for their insights. I can’t wait to share it with you! I already picked the graphic for it on Istock, and love it! If you’re not already on my mailing list, be sure to sign up today at the top of the page on the right hand side so you’ll be the first to hear about it for sale! I am selling it for a ridculously low price! It will include pics of my trip to the Bahamas, too. I was impressed with this woman’s confidence and boldness in sharing her products with me. I think I will do the same! You can find MY products at my Estore by clicking here! What God did with my book, The Hands Of A Woman! While at the Women of Destiny conference, I sold six copies of my book after my speaking session (15 women attended; that is over 50% of the women buying one – a great conversion rate!). When I was at the airport in Miami after my cruise, I met some neat women of God at my gate. They asked who I’d gone to the Bahamas with and why we were there, and I was able to share with them that I’m a speaker and author, and spoke at the Women of Destiny conference. One of the women, Lisa Wilt, was interested in my writing, and bought my book right there in the airport! Below is a picture of me and her after she bought it. You can get the book by clicking here. 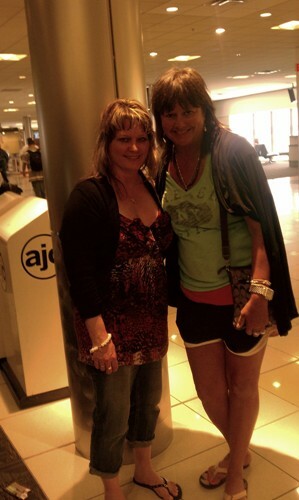 me at airport with new friend, Lisa Wilt! When I came home from the cruise and as I opened up my email, I discovered that a woman who contacted me previously about this book The Hands Of a Woman had bought and paid for 50 (FIFTY!) copies for her church’s Bible study. I had them shipped to her this past week, and they arrived to her on May 31. PRAISE GOD! I’m so excited about what God is going to do through her teaching this class! Go, God! To order your copy of this book with 8 women’s powerful stories about how they overcome some of their most fearful spiritual battles with faith and trust in God, just click here. What do you have that’s unique? 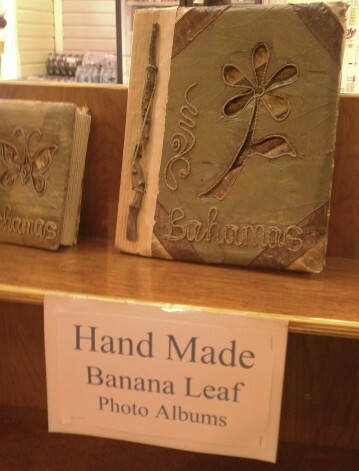 One cool product in Nassau in a souvenir store were photo albums made from banana leaves. This product is appealing because it is different! What can you offer others that is unique? 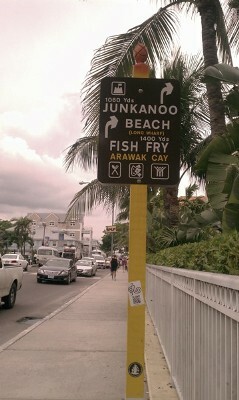 One of the beaches is within walking distance from the port. I wasn’t as impressed with this beach as I was with Grand Turk’s and Half Moon Cay’s clean beaches with the white sand. This beach actually had litter, and was smaller. It still had the beautiful blue-green water, though. There are other prettier beaches in Nassau, such as Atlantis. Atlantis is a resort and waterpark area on Paradise Island. It has 141 acres of waterslides, rivers, and rapids. I intend to go back to the Bahamas one day, and visiting Atlantis is on my bucket list! There is a lot to do in Atlantis. 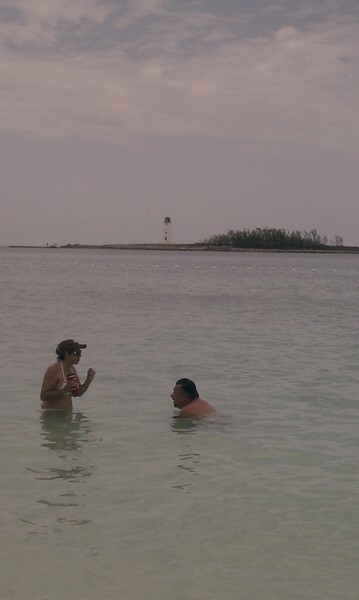 Here is the beach I went to at Nassau, Bahamas. There was a lighthouse in the background across the ocean. 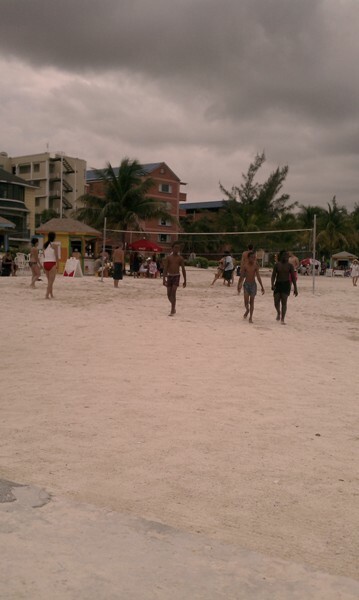 Some kids were playing volleyball on the beach at Nassau. That day it was overcast and it began sprinkling. 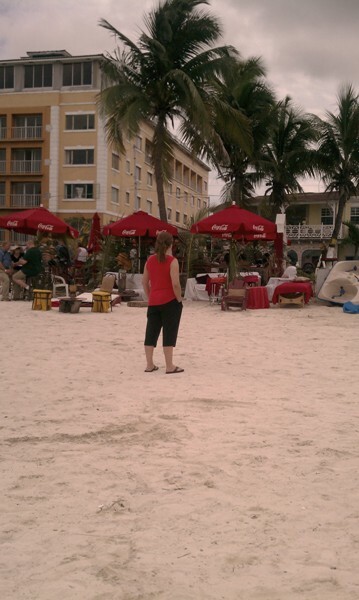 This was the busy food hut on the beach where everyone was getting cokes and snacks. They were reasonably priced for a tourist point – about $2 for a coke or bottled water. 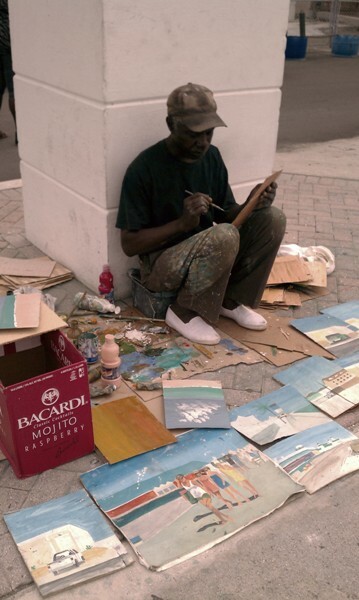 A street artist was working on his paintings by the port in Nassau, and I watched him with interest. 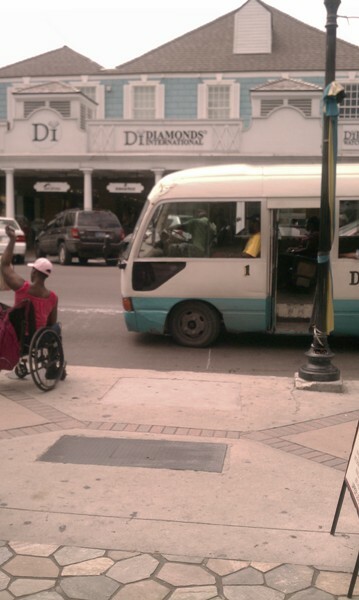 I like the one of the girls walking down the sidewalks in Nassau. He painted these pictures on rough canvasses. They were simple, crude paintings, but intriguing. Use whatever God has put in your hands for His glory. He’s put gifts inside of you that He wants to use for His kingdom! Before I went back to the ship, I stopped at a souvenir store, where they also had an ice cream shop. 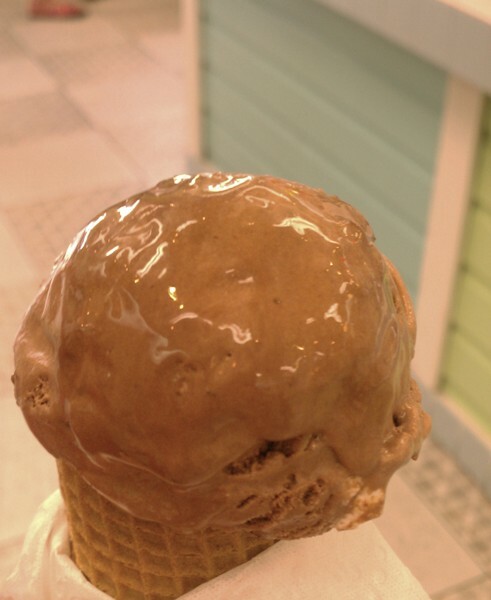 That chocolate waffle cone was so good on a hot day! Remember that sometimes God just wants you to rest and be refreshed. I love how God speaks to us in such a variety of ways: through His word, the encouraging words of others, nature, signs, billboards, clues, favor in circumstances – and even on cars! 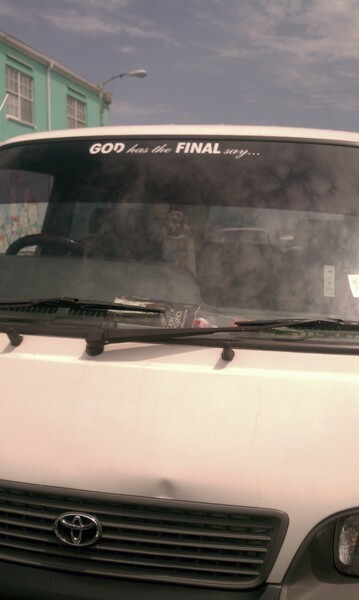 Below is a van in the streets of downtown Nassau, which has a sign on it: “God has the FINAL say!” AMEN! What is God speaking to your heart today? Satan didn’t want me going on this trip. He came in with distractions, fears, and attacks against me and my family before I left. But God has the FINAL say! 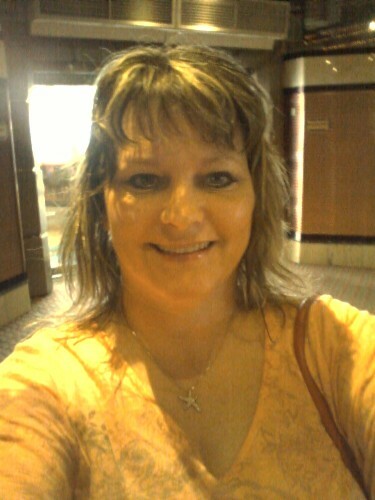 This cruise to the Bahamas was one of the greatest blessings in my life. I was so honored God and Tony chose me to be the keynote speaker at the Women of Destiny conference. He did amazing things while we were there, and I just praise Him and give Jesus Christ all the glory! When you walk in obedience to God, when you push past fears, distractions and obstacles, and do what He’s called you to do and to be, He will bless you for it. Tony is now planning another women’s conference on a cruise next year, this time to Jamaica! Whoo-hoo! She already has her speakers lined up for it. I am praying I can attend it for the impartation of the Word and the FUN, and that this time Ray can go with me. You can find out more info about the conference by clicking here. The cruise prices are extremely reasonable (I was shocked!). The deposit is only $25, and you will have an entire year to pay it off to go. Please let me know what you thought of my blog series on my cruise to the Bahamas. I’d love to hear your comments, your “aha’s,” or your questions. I will continue posting pics on my Facebook page and uploading videos to my YouTube channel, so keep checking back there each week until I finish! Also, I will let you know when my ebook Bahama Mama: When God Uses Ordinary Women For His Extraordinary Purposes is finished and ready for sale at a ridiculously low price just for you! I missed you while I was gone! 🙂 Thank you so much for your prayers and support for me and my family! You have no idea how much it means to me! I love you!